Music video for "Put Your Hand Inside The Puppet Head"
On some songs, like for example, "Puppet Head"...I wrote the song, and I didn't like the verses. So I gave it to John [Flansburgh], and he filled in all the blanks. The spoken break ("Memo to myself...") was added at the last minute during the recording of 1985 Demo Tape. The lyrics "Quit my job down at the car wash / Didn't have to write no-one a good-bye note" are most likely inspired by the song "Guitar Man", made famous by Elvis Presley. It begins "I quit my job down at the car wash / Left my mamma a good-bye note". The arpeggiating synthesizer in this song is likely the "funny" preset on a Casio keyboard. The music video, made before the album came out, uses a slightly different mix of the song. This mix is also featured on the Hello re-issue of the 1985 Demo Tape. Per the commentary from Direct From Brooklyn, the music video for this song, directed by Adam Bernstein, was filmed on the tails (pieces of film cut if a whole scene cannot fit on them) of the movie Married to the Mob. It was shot in an empty lot next to Con Edison plant, at North 12th St & Kent Ave in Greenpoint, Brooklyn. This was also the shooting location for the duo couch interview scenes in Gigantic. In the original script for Spike Jonze and Charlie Kaufman's film Being John Malkovich, this song was going to run over the end credits. The song can supposedly be heard in the background of a bar scene from the 1988 John Cusack movie Tapeheads, when he describes Tim Robbins' character as a "creative genius." Sadly, the song seems to have been replaced for the VHS edition. The song may have inspired a visual gag in the third episode of The Simpsons, "Homer's Odyssey," where Homer writes a suicide note on a memo that has the heading "Dumb things I gotta do today." 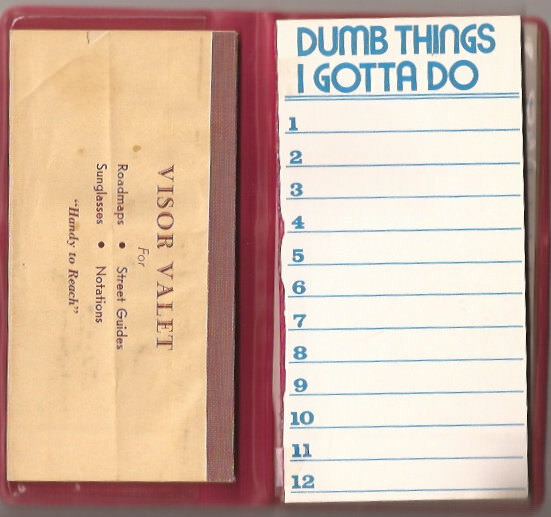 However, it's possible that both the episode and song are referencing a vintage list pad with the phrase.